I’m thrilled that Tony Burke of York University has posted a pre-publication draft of my article, “Gender and Authenticity in the Debates about Gospel of Jesus’s Wife Fragment” on the website for the North American Society for the Study of Christian Apocryphal Literature. I delivered an earlier version of the paper at the York University Christian Apocrypha Symposium in 2015 on a panel with James McGrath and Mark Goodacre, followed by a killer response from Janet Spittler. To read their great work, please buy the book! Tony Burke, ed., Fakes, Forgeries, and Fictions: Writing Ancient and Modern Christian Apocrypha. Proceedings from the 2015 York University Christian Apocrypha Symposium (Eugene, OR: Cascade, 2016). If you read Malcolm Choat’s informative post on “Lessons from the Gospel of Jesus’ Wife Affair“, this is the article he mentions. (Thanks for the kind shout-outs, Malcolm!) And while you’re over at the Markers of Authenticity Blog, read around for some more good stuff on antiquities. Not long before Tony suggested pre-releasing my article, I was contacted by another publication (one with a more general audience) to write for their blog about GJW. I agreed to write a “Lessons Learned” type post (not knowing Malcolm was doing something similar) and wrote something up. But due to editorial complexities and summer scheduling, it became clear that it would take at least two weeks for my work to be edited and appear. And the timing of it all was not going to work for me. So in part in the hopes of making this post my very last on the GJW, I am publishing what I originally wrote for another venue here on my own blog. The tone is a bit preachy. I used this style because of the anticipated audience, which has now changed. But I don’t have it in me to edit it again. Please keep in mind that the all the should’s and need’s in here I apply equally to myself. P.S. Yup, the irony of this post’s featured image (given the topics and politics of this post) is entirely why I chose to put the “sisters of Sinai” at the top. 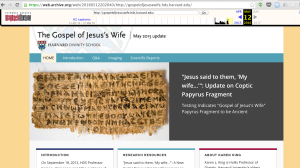 Late Wednesday June 15, 2016, The Atlantic published an essay by Ariel Sabar about tracking down and identifying Florida man Walter Fritz as the owner of the papyrus fragment that has come to be called the Gospel of Jesus’s Wife (hereafter GJW). Sabar’s piece exposed inconsistencies in Fritz’s documentation of ownership of the papyrus and inconsistencies in Fritz’s claims about his personal history and the papyrus. It also revealed that Fritz knew Coptic, had financial difficulties before the bringing the papyrus to Harvard professor Karen King’s attention, and had an ethically questionable past. These details bolstered the argument that the papyrus was a forgery—an argument already made using scholarly methodologies and proven to the satisfaction of most experts in the field two years ago. The day after Sabar’s essay was published, Dr. King, who published the papyrus and argued for its ancient origins, announced that she now believed the document to be a modern forgery. The controversy around this document has captivated Biblical Studies as well as the general public. It is now time to move from dissection of past events to asking what we as a field have learned, or should learn, from these past four years. Biblical Studies has been rocked by multiple allegations of unethical work with antiquities of uncertain provenance. The James Ossuary, the Green’s Bible Museum collection, and the Gospel of Judas are other examples. An object’s provenance is the account of its discovery or excavation, subsequent ownership, and collection history. The inconsistencies in the documentation and the owner’s narrative about provenance from should have raised flags for scholars initially working on it and for Harvard University that the papyrus was likely a modern forgery or an illegally trafficked antiquity. As law professor Erin Thompson and papyrologist Roberta Mazza noted in 2014 and more recently, antiquities from the Middle East, including Egypt, have appeared on the market with increasing frequency. Looting and theft are too common. Working with unprovenanced antiquities encourages their trade. Arguably, working with any antiquities owned privately (rather than in museums, libraries, and universities) directly contributes to the legal and illegal markets. When scholars authenticate documents in private collections, identify them as historically important texts, or even publicize already identified, privately held documents, the monetary value of the documents rises. Working with antiquities in private collections, and especially with unprovenanced antiquities risks contributing to shady markets in antiquities. We also need to think twice about whether the academic pursuit of knowledge is sufficient justification for working with poorly provenanced, privately held antiquities given these risks. Are our individual scholarly motives to further knowledge in the field or to promote ourselves as innovative “discoverers”? The code of ethics does allow for privacy and confidentiality but provides this exception to a general rule of transparency in the context of protecting “individuals and groups who have no voice or role in collections’ creation, retention, or public use.” A collection owner’s personal preference to remain anonymous is not one of the SAA’s example cases. Universities approached by private individuals about permanent or temporary manuscript donations should follow this code of ethics. Unprovenanced or poorly documented artifacts currently exist in public, university, or museum collections. At a recent conference in early Christian studies, I perceived an uptick in interest in the historiography of our field and our sources. How did these objects come to be in our collections and archives, and how are those accounts meaningful for the field? Excavating the history of these objects can advance knowledge in our field, in part by exposing a past history of unethical collecting and excavation that we wish to correct for the future. Individual scholars need to consider whether our research on these objects will ultimately provide a kind of back door justification for the ongoing market for future looters, illegal collectors, or even unethical colleagues. Are questionable artifacts ethically purified when they are donated to public or nonprofit collections? This is where institutional commitments are important for staking out ethical policies for the future: current or aspiring owners of antiquities collected under shady circumstances should not be able to “cleanse” them of their questionable background by donating them to a museum, library, or university (while also securing a tax break for such a donation). Museums, libraries, and universities need to consider their policies on accepting permanent or temporary donations of privately held antiquities. Full transparency about an object’s history should be a minimum consideration. At the extreme, we may even wish to reconsider the donation of private antiquities at all. Foregrounding an object’s material history and context, rather than privileging the text or art on it, could shift our field in important ways. Media coverage of the Green Bible Museum, the GJW, the newly discovered Sappho poem, and the James Ossuary tell us that the American public cares deeply about the ancient world and early Christianity. The popularity of video games such as Assassin’s Creed set in ancient and medieval locales proves this interest goes beyond the readership of the New York Times. Unfortunately, with a few exceptions (such as this piece in The Atlantic), media accounts misrepresented scholarly consensus on the GJW. Since spring 2014, for reasons described in the linked Atlantic article, the vast majority of Biblical scholars have believed that the GJW fragment was a modern forgery. Most people outside of academic Biblical Studies, however, still believed the case to be open for debate. Sabar’s essay in the Atlantic convinced the last major holdout (Dr. King herself), but it did not change scholarly consensus about the object. The scholarly process, despite flaws along the way, fundamentally worked: one scholar published a text for the first time, other scholars wrote analyses and critiques, and within two years, a scholarly consensus of modern forgery emerged. Moreover, Humanities scholarship—careful reading and analysis of the GJW and related documents, not ink tests or radio-carbon dating—led to the discoveries. We had to relearn a lesson we should have remembered from the James Ossuary controversy: “hard” scientific tests designed to date an object often can’t definitively prove authenticity. The Humanities and its methods and matter profoundly. The academic production of knowledge is increasingly occurring online, on open websites. The GJW controversy is the most visible recent example, with bloggers writing at a feverish pace, building on each others’ work. Eventually some of this work was published in a peer-reviewed journal (New Testament Studies), but this work began online. King and the other scholars who worked with her to authenticate the papyrus, however, used more traditional venues: a conference presentation before colleagues and then peer-reviewed publications. Over the two years between the GJW announcement in 2012 and Askeland’s proof of forgery in 2014, there was little crossover between these two groups. This divergence cannot be boiled down to a simple difference between “slow” traditional scholarship and “fast” digital media, even though the speed at which online work disseminates was a factor. Elite research universities such as Harvard value the individual scholar who makes new, field-changing discoveries and publishes them in peer-reviewed (print) journals and books. Professors under consideration for tenure and promotion at such schools regularly report being told that digital scholarship doesn’t “count” for tenure and promotion as much as print—even if the digital scholarship undergoes some form of review. Additionally, much digital work is co-authored and collaborative. Tenure and promotion committees ask skeptically: how much did you really contribute to this publication? All universities, but especially the research universities producing our next generation of professors, need to figure out how to value digital scholarship and collaborative scholarship, and how to publish and archive that work in their libraries and repositories. They cannot leave it to the work of professional associations such as the Society of Biblical Literature, because unfortunately the SBL is also struggling with how to transition to a more digital and open academy. (I have blogged about this issue, as well.) Instead, we should look to smaller institutions, which often have more progressive tenure and promotion guidelines and cultures. Peer societies, such as the Modern Language Association with its digital Commons, also can provide models. Additionally, individual scholars need to be more aware of and responsive to the digital scholarly ecosystem. In the case of the GJW, the scholars who initially authenticated the manuscript (Karen King of Harvard, Roger Bagnall of NYU, Annemarie Luijendijk of Princeton, and Ariel Shisha-Halevy of Hebrew University) did not have online presences. It is unclear how aware they were of the intensity of the online scholarship, or the extent to which other academics were persuaded by this online scholarship. All scholarship has an “agenda.” The GJW revealed that the Biblical Studies scholarly “community” is a fragmented one, with different agendas in various subcultures. But this situation existed regardless of the GJW events. 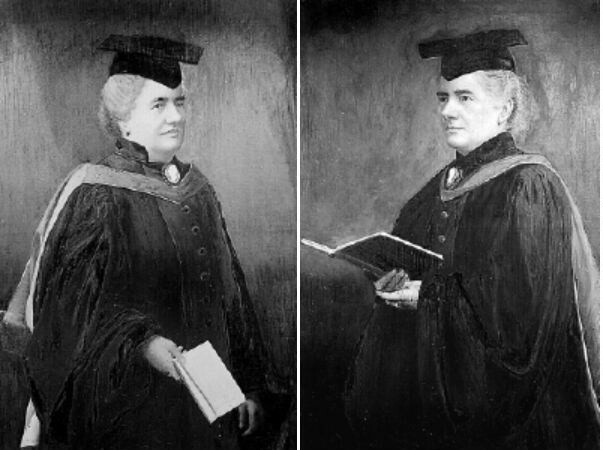 King was accused of advancing a “radical feminist agenda” over scholarship. This blog post is just one example. But evangelical biblical scholars have agendas, as well—to find the earliest datable manuscript referencing Jesus, or to prove that Paul authored all the letters in the Christian canon attributed to him. Feminist scholarship has produced important work, including beginning to provide us the history of half the human race. It has done so because of its overt agenda to uncover the history of women. Traditional Biblical philology and manuscript studies also produces errors. Papyrologist Brent Nongbri has re-dated several major biblical papyri to later dates than previously believed. He is essentially arguing that previous biblical scholarship was wrong. Such is the business of research. Diverse scholarly ecosystems lead to advancements in the field. I would add to this a call for professionally secure scholars to be more open about their mistakes. Professors with endowed chairs at elite universities could model what it looks like to listen openly and respond to critique. In this case, such work would have involved responding more rapidly to calls for transparency about the ownership and provenance of the GJW papyrus. We often rewrite ancient history and biblical history. We often publish new translations of old texts that make previous publications obsolete. We need to foster a culture in which scholars strive for accuracy but are not wary of the kind of full transparency I describe out of fear of being vilified for mistakes. Attacks on the Humanities as irrelevant or unmarketable in a 21st century economy make the vulnerability of Humanities academics even more acute. Academia has responded to charges of the Humanities’ “irrelevance” by attempting to “prove” our importance with more public engagement. Humanities professors are encouraged to write for a more public audience and to engage with the media. In this environment, scholars whose research takes risks or who work on controversial find themselves in a double-bind: retreat to the ivory tower and earn the label of “irrelevance,” or engage the public and risk being thrown to the wolves. As a media event, the GJW is a cautionary tale. Harvard University’s communication strategies exacerbated the controversy. Harvard sought the greatest possible media exposure for the University and for its faculty “talent”— a New York Times headline, Smithsonian documentary, etc. In recent days, though, Harvard has left King to withstand media scrutiny alone. Universities need to prepare for media controversy and protect faculty they have encouraged to engage. (Dr. Tressie McMillan Cottom has written about this problem as a more widespread phenonmenon in her blog post “Everything but the Burden: Publics, Public Scholarship, and Institutions.” Go read it.) After Sabar’s article appeared, the Harvard Divinity School Dean and Harvard Theological Review did not comment for days; the Divinity School communications office stated only that it was “reviewing” the article. Five days later, a statement appeared from the Dean; it repeated key facts of recent events and articulated Harvard’s mission to pursue knowledge. This response is inadequate. Although some of Sabar’s reporting was new, allegations about forgery and unreliable provenance have circulated for years. The university has had ample time to formulate a response. That response needs to include acknowledging its own institutional culpability in the story. As someone who works on digital scholarship and runs multiple websites, I also take away from this controversy a lesson in owning and controlling one’s digital presence. In 2012, as part of the media rollout of the GJW, Harvard created an official, standalone website to publicize research. This dedicated site appears to be run by Harvard’s administration or staff. In other words, it is a communications portal, not a research portal, even though it purports to disseminate Dr. King’s latest research on the papyrus. Although King’s profile is prominently displayed, nothing on the site indicates that she or other scholars involved in the research control the content. This kind of site may have been created with an eye to supporting and promoting faculty research, but it can put the institution in a conflict of interest and can place its faculty in an untenable situation. Until the afternoon of June 20, the GJW website still stated that scientific tests proved the papyrus to be ancient. Even though the site now hosts the Dean’s recent statement, it includes nothing about the research from 2014 proving the papyrus to be a modern forgery. Through omission, the institution misrepresented the state of the field rather than publish notice of research that contradicts their faculty. Arguably, as of this writing, it continues to do so by addressing only the Sabar piece. Individual academics need to consider how much their own personal identity and reputation will be wrapped up in their university’s media exposure. While we may want personal exposure, it may come at a price. Questions we should ask include: should we insist that our institutions minimize our own personal recognition in press releases as a matter of course? Should we assert control over our digital identities by running our own websites if we choose to “go digital”? A more difficult question is what kind of relationship we individual academics cultivate with the media, and as a result, with our institutions’ media relations unit? Many colleges and universities see media publicity as a means to burnish its reputation and attract donors. This does not mean that media exposure is inherently corrupt. Many of us want the broader public to know more about the ancient world, ancient religion, and Biblical Studies. But we also need to be wary of the commercialization and commodification of our work. This entry was posted in Gender, Gospel of Jesus's Wife. Bookmark the permalink.